Click to enlarge. This is just glorious. It’s beauty lies in the attention to detail. Provider? Bill Johnston, PR Director. 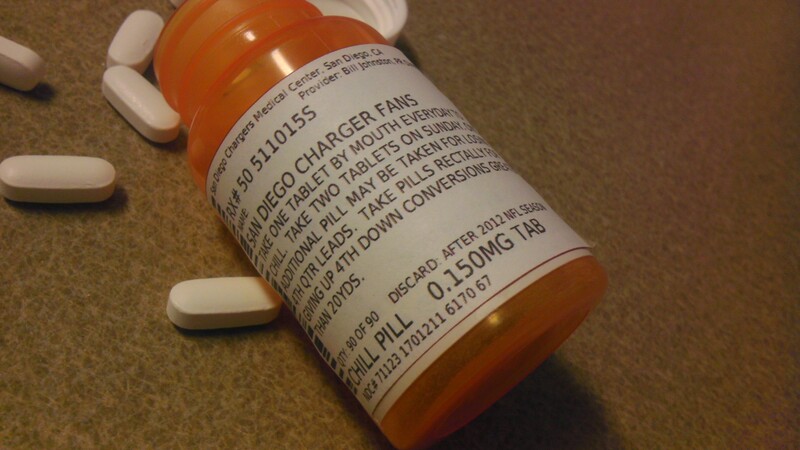 The Chargers chill pill, revisited. Discard: After 2012 NFL Season. “Take pills rectally for giving up 4th down conversions greater than 20yrds.” Sounds about right. This entry was posted in Football, NFL and tagged bill johnston, bill johnston chargers, bill johnston chargers pr, Chargers, chargers chill pill, chargers pr guy, take a chill pill chargers fans. Bookmark the permalink.